Glass Beach: Mama's Got a New Bag! It's rather rare for me to make a bag for myself. You usually see me wandering around with a proto-type or minor sewing disaster slung across my shoulder. I splurged on this bag because my ancient messenger bag has been leaving bits and pieces all over town lately AND Craft Magazine and Amy Butler are having a bag-making contest. I contemplated entering my Sophia Bag, but this Amy Butler "High Street Messenger" pattern was calling to me from my pile of Good Intentions. To better justify this project, I stipulated that I could only buy minimal fabric and everything else was from my stash. Fortunately, I'm a pack-rat and only had to buy the solid curry fabric and supplement my stock of brown twill. I even found the marine hardware I used for a closure in my box of "General Randomness." I made some modifications to the pattern, mostly by-passing zippered pockets. 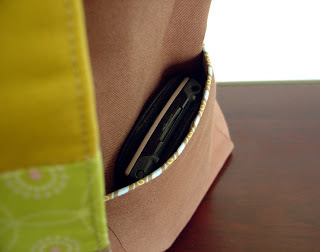 I trimmed the exterior pockets using Quenna's brilliant faux piping tip. My favorite part was the patchwork front flap. I used to be a quilter ages ago and this project gave me a chance to reacquaint myself with my loyal walking foot and the joy of hand sewing. I've wanted to participate in Sew, Mama Sew's Quilting Month and just haven't had the time but I think the quilting bug has been reintroduced to my crafty agenda. All in all, this was a fun project with only a few mis-steps. Of course, thinking about the prize of a new sewing machine kept me going through the hard parts (not that I could say any of these thoughts out loud because, you know, my stalwart Viking was RIGHT THERE!). P.S. 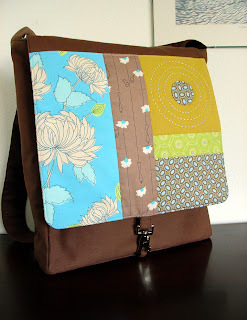 I've been checking out the other entries and there are some amazing bag-makers out there. I don't think my Viking has to worry about being replaced any time soon. That's ok, though, I got a new bag out of the deal! Your messenger bag turned out so nice -- I love the fabrics you chose for the flap and the unique closure. Isn't is nice to not carry around the "seconds"? this bag is gorgeous! I love the patchwork on the front flap. I've been eyeing this pattern or the messenger bag pattern by Montessori by Hand. Definitely going to give one of them a try soon! Thank you, Quenna, Rebekah and Allyson! It's very high praise coming from such talented craftswomen. This bag is FABULOUS!!! So nice! The front is just perfect and the little detail faux piping - excellent. Nice job! Everyone will envy you when you're out-and-about with this bag. Thanks, Jenn and Liz. My bag and I are blushing!